In recent years we’ve become increasingly aware of abundant errors in scientific research, many of which stem from bad statistics. Many of the ways in which these studies fail statistically are encouraged by academic journals. The way in which p-values are relied on excessively but almost routinely misused is a common example. Even though researchers must understand a particular subset of statistical concepts and techniques to do their work, relatively few possess this understanding. In some fields of scientific study you can even earn a doctorate without taking a single course in statistics. I’m encouraged by the fact that this problem is getting more attention today and that some fields of science and some scientific journals are diligently working on solutions. 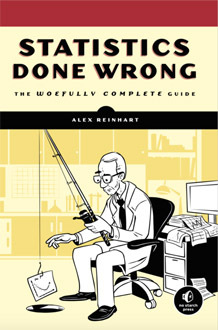 If you’re involved in scientific research, even if you believe that you possess all of the statistical chops that are necessary, you owe it to yourself, your field of study, and the people who stand to benefit from or be harmed by your work, to read Statistics Done Wrong: The Woefully Complete Guide, by Alex Reinhart. This book was written for you. Reinhart is a statistics instructor and PhD student at Carnegie Mellon University who is especially tuned into the statistics that are required for scientific research and the ways in which they frequently go astray. He covers the gamut, including inadequate samples, misunderstandings about statistical significance, disregard for statistical power and measures of confidence, plus many other errors that routinely plague research studies and render them useless and sometimes even harmful. Reinhart knows this territory intimately and cares about it passionately. He exposes and explains the problems, describes the impact that they’re having on science and the world at large, and also shows us how to solve them. This is not a primer in statistics, so don’t begin with this book. Reinhart assumes that you’ve taken a course or read a book or two, but that your exposure hasn’t fully equipped you with the statistical understanding and skills that are needed to do scientific research, especially experimental studies. You could skip this book and get by as a scientist who produces erroneous and worthless work but manages nonetheless to get published and advance through the ranks. Is that who you want to be? Is it enough to be recognized as a success or do you actually want your findings to be accurate and count for something? If you choose the latter, Statistics Done Wrong will help you develop some of the skills that are required. The title Woefully Complete Guide is overoptimistic. Future generations will uncover entirely new techniques, which will be misused to support false conclusions in ways we cannot even dream of.